Description : Purchase Mac Memory Card Data Recovery Software to get back digital photos, audio, video songs, mp3 music from formatted memory card. 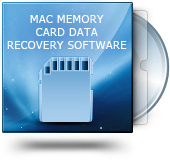 Mac memory card data recovery software recovers deleted digital photos, memorable snapshots and other memory card saved data. Advanced picture card retrieval application provides recovery of your lost compressed files from corrupted memory cards of higher capacity.